There is a contrast between correct and incorrect sentences in every example. 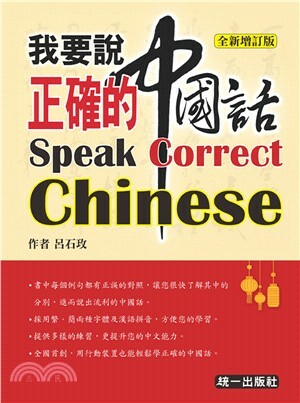 Traditional and simplified Chinese character as well as pinyin are used in this book, which helps you learn more easily. We provide many kinds of exercises for you. I have always had aspirations to write a book helping foreigners learn Chinese, and this particular one is inspired by a book named The Correct Rules of English. This book was extremely helpful to me when I first began learning English, which inspired me to write a book that would be as helpful for foreign Chinese learners. I have been a Chinese teacher to foreign students for more than twenty years. During the years I have encountered many students from many different countries. However, they have one thing in common, and that is they usually make the same mistakes while speaking Chinese. Sometimes, even advanced students can easily make basic mistakes. Therefore, I have written this book hoping to help these students speak Chinese correctly by contrasting correct and incorrect sentences. I have compiled some of the most common mistakes in the Chinese language and arranged them in an easy-to-follow method to help students avoid making them and speak perfect Chinese. This is my first time writing a book that deals with details in the complex Chinese language. I have put in my best proof-reading efforts, but there might still be careless mistakes. Please allow me to apologize for them now. All valuable corrections are welcome and greatly appreciated.